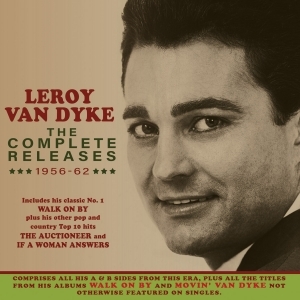 Leroy Van Dyke is a country singer and guitarist who is best-known for his memorable landmark crossover pop-country hit in 1961 “Walk On By”, which made him a household name on both sides of the Atlantic. After a flurry of pop chart success which followed that iconic success, he became a fixture on the country scene with a string of hits through to the late 1970s. This 42-track 2-CD set focuses on the early years of his career, and comprises the A & B sides of all his singles for the Dot and Mercury labels from his 1956 debut through to the end of 1962, along with all the titles from the Mercury albums released during that period “Walk On By”, “Movin' Van Dyke” and “Music from the Broadway Show ‘All American’ Goes Country Style” not otherwise released on singles. As well as the country No. 1 and pop and UK No. 5 “Walk On By”, it includes his other Top 10 country hits “Auctioneer” and “If A Woman Answers” along with his other country, pop and UK chart entries “Black Cloud”, “and “Big Man In A Big House”. It showcases his distinctive talent that enabled him to straddle the increasingly blurred divide between pop and country during this era.